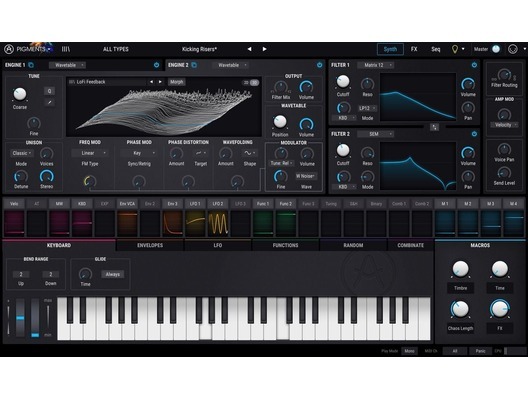 We introduce to you the Arturia Pigments Wavetable Software Synthesizer. Arturia have taken their years of digital music expertise and produced this incredible piece of software that turns your audio into a visual spectacle. 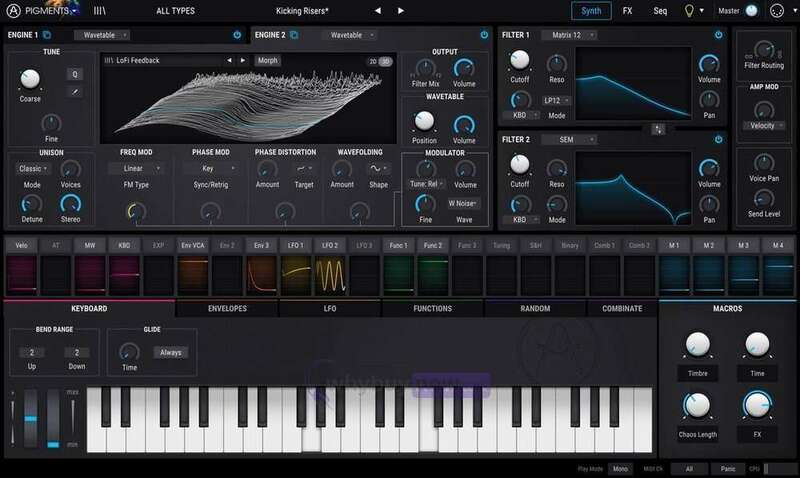 There's no need for fiddly, easily-tangled wires any more with the Pigments Wavetable Software Synthesizer you'll have an Analog and a Wavetable engine at your fingertips with stunning, rainbow-coloured visual cues. Experiment with three envelopes, three LFOs and three function generators; play with a range of studio-quality effects; set-up, play, and customise arpeggios - the possibilities for incredible audio are almost limitless. A software synthesizer unlike any other, Pigments gives you all the tools you need to fully realise your creativity. Now you've seen what Pigments has to offer, the proverbial paint in your palette, it's time to reveal the true power of the instrument. Pigments represents a truly modern approach to modulation. It lets you modulate practically any parameter with anything you choose, with no limit on the number of connections. Make changes graphically, with source or destination-based editing. Easily see, learn, and understand how different elements behave and interact with clear visualisation. Choose a source parameter, choose a modulator, choose how you want them to interact, and you've just made a new combinator. An amazing way to create experimental modulations that will keep your imagination running wild. When you've created a synth sound with ideal parameters, animated just the way you wanted it, it's time to add the finishing touches with some studio-grade effects. Pigments offers twin insert busses and a send bus, each one letting you choose and combine any 3 of the 13 effects to create a truly refined sound. You can even synchronize their parameters to your modulation. With the huge variety of software synths on the market, choosing one that's right for you is no simple task. This is why we created Pigments. We wanted to make the process of discovering sounds, exploring the colours, tones, and vibrancy of sound a joy. Using Pigments is incredibly satisfying right from the start, needing very little expertise to enjoy and explore, while also being hugely rewarding to adventurous sound designers. Pigments contains hundreds of amazing preset synth sounds from top sound designers and big-name artists alike. Whether you want experimental soundscapes or neon synthwave lead lines; monstrous basses or quirky, organic percussive sequences, you'll find them in the extensive preset library. You can mark and recall your own favourites, enter comments, and set up playlists. Theres never been a more intuitive way to manage your library of designer and personal presets. Mouse-over the "Ideas" icon and the sound designer's recommendations will be highlighted, instantly showing you what parameters to tweak to make the most of a preset. You can also make your own notes, perfect for jogging your memory for big live sets!